Merchants National Bank recently donated $500 to the Hillsboro After Prom Party. Bank representatives are pictured here with Hillsboro High School students and After Prom Committee members. Pictured in front to the left, from the left, are MNB’s Paul Pence and Bertha Hamilton, Elaine Gilliland with the After Prom Committee and MNB’s Denise Fauber. 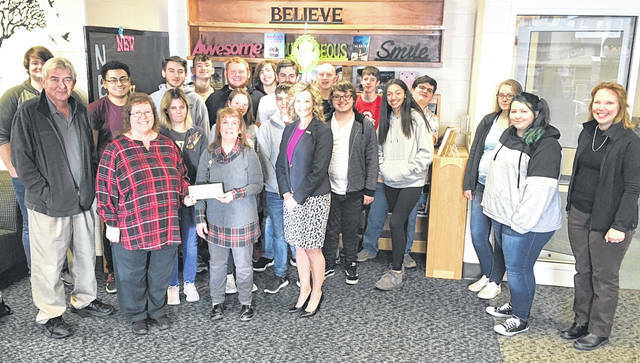 https://www.timesgazette.com/wp-content/uploads/sites/33/2019/04/web1_MNB.jpgMerchants National Bank recently donated $500 to the Hillsboro After Prom Party. Bank representatives are pictured here with Hillsboro High School students and After Prom Committee members. Pictured in front to the left, from the left, are MNB’s Paul Pence and Bertha Hamilton, Elaine Gilliland with the After Prom Committee and MNB’s Denise Fauber.